About six weeks ago I started facilitating a group coaching program called $10K Bootcamp. The program is designed to help web professionals over a ten week span to land their first $10,000 project (or learn to land them more consistently if they already have a couple under their belts). Why $10K? What’s the significance? Being someone that learned in the trenches how to go from selling the low thousands to solid five figure deals every time, I took it as my responsibility to create a program to solve this problem. I wanted to provide a roadmap for web professionals to get out of this rut and on a path to prosperity. As part of our launch of the $10K Bootcamp, my email series made an offer for a free 30 minute consult with anyone that would take it. I ended up talking to 76 web professionals in a week. I simply asked each person at the start of the call, “what’s your biggest pain, the one that keeps you up at night?” I knew it was going to be crazy intense, but I had no idea how much pain I would uncover. Just about every company I talked to got their clients from referrals. When I asked who they worked with, it was “small business” otherwise known as “anyone that will hire me.” There was no concept of defining an ideal customer, a marketing segment, or a marketing channel besides word of mouth. At a more tactical level, web pros I talked to had issues once they actually started talking to a lead. They lacked a clearly defined process for how they handled new business. I’m not saying that you need to run a boiler room here, but if you are winging it on every opportunity that knocks at your door it shows to the client. Letting your client lead you through their sales process is probably one of the most dangerous ideas when it comes to selling web solutions. The average client buys very few websites. You sell them every day (or at least you should be). The last bucket of issues revolved around the actual work being proposed and delivered. The amount of inconsistency in this industry illustrates why clients have such varied expectations. There wasn’t a clear understanding of what a good website project entails. I’ve been teaching and publishing video courses online for a long time. I love doing this because I can broadcast well produced knowledge to hundreds or thousands of people with insane efficiency. The downside is the level of interaction. I can’t ask questions and probe in real time. I decided that in order to help web professionals solve the above problems, I needed a high dose of interaction. Not only that, but I needed the dynamics of a group to bring new angles and problems to the table each and every week. So in late April, 34 brave souls became the first class of 10k’ers. 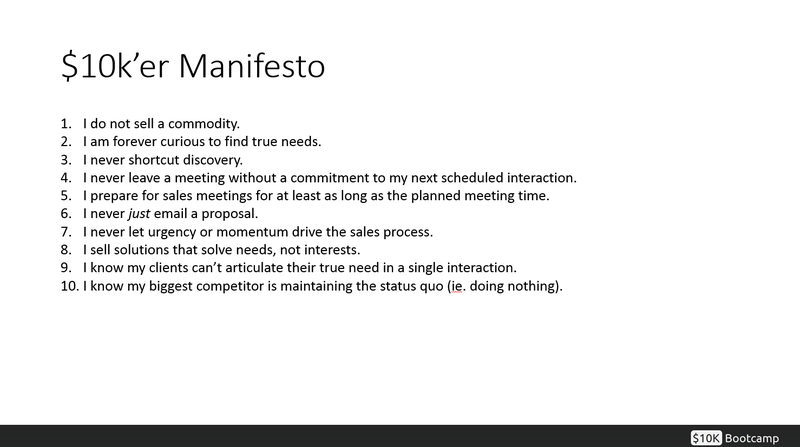 In the first session, I presented my $10K Manifesto. And we were off. Meeting for 90 minutes in small groups each week. Each session we pick 1 thing that we hold ourselves accountable for. There is a ton of supporting content. Most importantly, we talk in real-time about issues and opportunities that are happening in our businesses. We get what I call the fishbowl effect. Even if I don’t have a problem today, but someone does, I get to listen and provide feedback to that issue which will in turn help me learn more and know what to do if it ever happens to me. Kind of like looking into a fishbowl – able to see everything going on, even if you aren’t in the bowl. Over the next few weeks I will be sharing some insights publicly with what I’ve learned so far from this group of crazy hard working people. I know the premise of the program is to learn from my lessons learned, but as the facilitator, I’m taking in so much. Each 10k’er brings their own experience and perspective to the table. The social learning and accountability aspect of the program has been phenomenal.